This December 2011 report from Global Financial Integrity, “Illicit Financial Flows from the Developing World Over the Decade Ending 2009,” finds that despite the tremendous drop in global trade following the global financial crisis in late 2008, the developing world still lost US$903 billion in 2009. The report finds that from 2000-2009, the developing countries lost US$8.44 trillion to illicit financial flows, a sum which outweighs foreign aid by a ratio of 10-to-1. The top five sources of illicit financial flows over that period were China, Mexico, Russia, Saudi Arabia, and Malaysia. Global Financial Integrity updates the data from this report on an annual basis, at times making substantial methodological revisions. 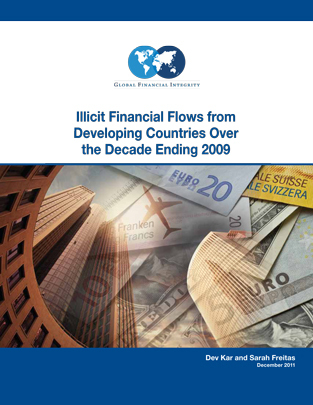 The most recent update is Illicit Financial Flows from Developing Countries: 2003-2012. GFI recommends citing from the most recently released research.